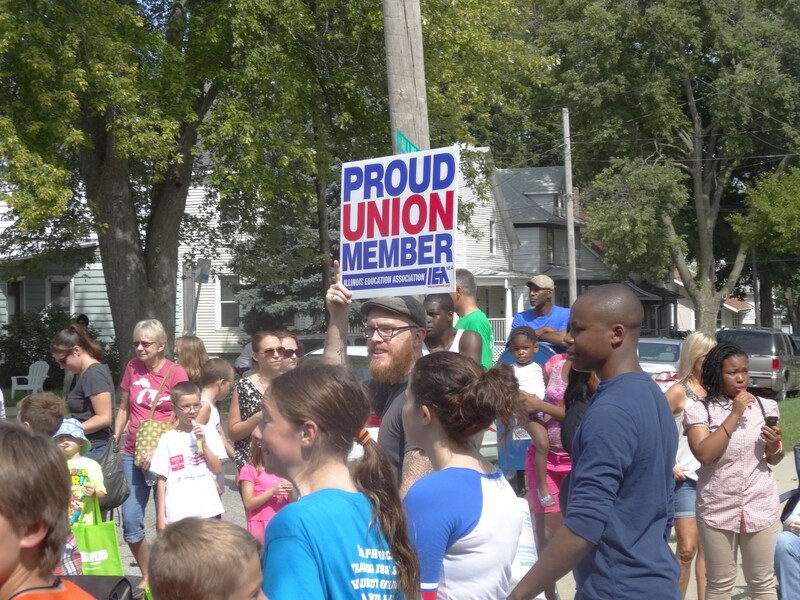 On Labor Day I took my daughter to the parade. It’s an event full of meaning but for her it was mainly about the candy. She was not disappointed. In a scene resembling feeding time at the barnyard candy was thrown like chicken feed from passing floats. Children scurried, pecked at the ground, pushed and shoved each other, and then waited eagerly for the next handful of faux nourishment to be tossed their way. There is exactly one day each year when the workers who built this country are recognized. It is a day to celebrate the struggles of workers to win things like the right to join unions, the 40 hour work week, the end of child labor, safety regulations, a minimum wage and something we call the weekend. For the other 364 days each year Republicans are pretty much engaged in open warfare against workers and their unions. They oppose regulations that protect workers safety because they are a burden for employers. They make it hard for workers to form unions because unions interfere with management “flexibility”. And they pass laws that deny workers the right to negotiate as a group with their bosses. ve been successful implementing their anti-labor agenda. In Wisconsin and Indiana they have proudly gutted the rights of public sector workers to bargain collectively. And Michigan, the spiritual homeland of the labor movement, is now a so-called “Right to Work (for Less)” state thanks to Republicans. As if that weren’t enough, the GOP steadfastly opposes raising the minimum wage (in fact it would prefer to eliminate the minimum wage altogether). And when proposals are made to insure that the minimum keeps up with inflation they have the chutzpa to tell us that doing so would hurt workers. Only in a Bizarro world where Republicans march in Labor Day parades could making more for each hour of work be sold as a bad thing. Workers today — not just those in unions — work harder and are more productive, yet are paid less than they were forty years ago. And Capital’s share of the national income has been growing while labor’s share shrinks. Yet the GOP dismisses workers’ concerns about growing inequality as “whining”. Given all this, why would Republicans show up waving as if they belonged in a parade celebrating labor? Equally perplexing: why don’t workers throw that candy right back at them for having the audacity to crash their parade? One might think that the integrity of GOP candidates would be enough to keep them from participating. Short of that, perhaps fears of a grumpy welcome from workers lining the streets who can see through the hypocrisy of their presence would deter them. But the Republican politicians in the parade were all smiling. And the crowd, if my keen powers of sociological observation can be trusted, consisted mainly of working class souls who smiled back at them. Sure, they were throwing sweet, delicious candy, but the irony was bitter. I looked around to see if anyone else was noticing this. Alas, it was mostly people shamelessly pleading for Tootsie Rolls or bragging to their neighbor that they once ran into this official at the super market. I like my Laffy Taffy as much as the next guy….but come on! What is in that candy that makes us forget the undeniable fact that the stronger the Republicans get, the weaker unions get? And the weaker unions get, the more precarious the lives of all workers’ become? t, unions are the only institution with the capacity to improve workers’ lives. They are the only viable counterweight to the unmitigated economic power of the corporate regime bent on “saving costs” and increasing profits on the backs of the workers. And in the electoral arena where the 99 percent are increasingly over-matched, unions are the only chance workers have to be heard. It’s sad that Labor Day has been stripped of its meaning. Much like other holidays that have morphed into occasions to celebrate consumption, the meaning of Labor Day is becoming lost. Today it’s nothing more than “the unofficial end of summer,” or time to head to the malls where poorly-paid workers with no paid holidays will help you take advantage of some great deals on end of season merchandise. Labor Day has become all this, but apparently it’s now also a day for Republicans to hand you a sucker while they ask for your vote. At least it remains a day rich with symbolism.